Call it love at first sight. The first time I landed on Skip To My Lou’s blog, my eyes had a feast. I instantly fell in love with its free to download templates. Cindy, the founder of the blog, is very creative. She has lots of artsy party favors, crafts and templates to offer. Her works are simply amazing! 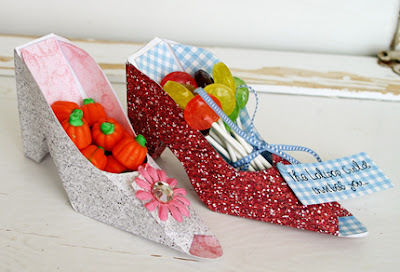 One of Cindy’s creations that I am planning to try this weekend is this party shoe craft which is great for a birthday party giveaway. No, I am not hosting a party yet, cutting is just my way to distress. And I just thought that there might be a Shining Mom reader out there who would also like to try this very chic craft with me, hence this post. This weekend, let us all hop over to Skip To My Lou’s blog and try some crafts. Here’s how the finished paper shoe product looks like. Do you love what you are seeing? Might as well make your own! Feeling nspired? Do visit the links below to Skip to My Lou’s blog to create your own shoe craft give-away. If you wish to use digital papers, do visit Stephanie at the Digital Digi for the step by step tutorial as she created her own version too!